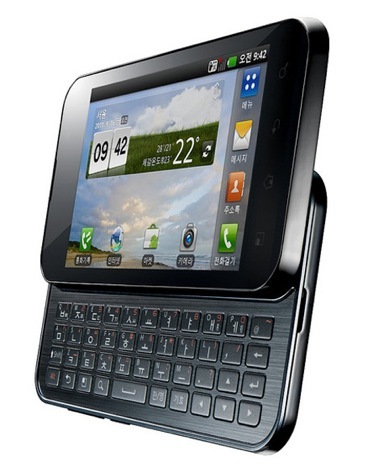 LG have announced their new android phone the LG Optimus Q2, a QWERTY slider phone. The phone is expected to launch next week in South Korea, but we have no details on any worldwide release at the moment. LG Electronics, thin and lightweight QWERTY smartphone dual-core LG Electronics the ease of use, further volunteer opening night performance design will showcase a full QWERTY smartphone. LG Electronics LG from next weekend, to be released exclusively through yupeulreoseureul 'Optimus Q2' which caused a frenzy last year, a QWERTY smartphone 'Optimus Q' is the successor. After changing the perception of a full QWERTY smartphone, and ease of follow-up model for the response from the spread of a highly reflecting consumer demand for the inconvenience of traditional QWERTY smartphone has greatly improved. 'Optimus Q2' 4-inch WVGA display with IPS-grade form of a horizontal slide, be doing a combination of the QWERTY keyboard, though, the entire thickness, 12.3mm, weight 147g thin and light. In particular, compared to existing products thickness 2mm, weight 10g reduces the country's thinnest, lightest and most of the same family for sale, more spacious keyboard layout is easier to enter. 1.2 gigahertz (GHz) dual-core processor, the brightest of the existing 700 smartphone knit (nit, luminance units) of the IPS display, gingerbread and the operating system to mount the high performance is achieved. Also, apply touch-sensitive front panel buttons, highlight the clean, elegant design and black / white, two species will be released. In addition, up to 22 times faster compared to Bluetooth to implement the 'Wi-Fi Direct (Wi-Fi Direct)' support, authentication and ease of content sharing between devices, 5.0 megapixel camera and video call front camera, was mounted only. LG Electronics nayoungbae MC (Mobile Communications) is responsible for Korea, "one step further with a full QWERTY smartphone QWERTY chulsihae 20-30 hit the preferred customer focus," said "as a distinctive design and performance of the predecessor, will lead the success story," he emphasized.